Because it is important. This Fair Trading Charter together with the Important Holiday Information form the basis of a legally binding contract between you (the person making the booking and everyone else named) and us (GEE VEE TRAVEL 36-38 Eldon Street, Barnsley, S70 2JB). If you take a few moments to study them you will see that they set out, in simple terms, what responsibilities we each have under the contract. Reading it now may help you avoid problems later. Our Fair Trading Agreement and holiday information set out clearly and simply the responsibilities which we at GEE VEE TRAVEL have to you and which you in turn have to us when a contract is made between us. How do I make a contract? You can make a contract in a number of ways, by writing to us or by phoning us. The contract between us is made when your booking is entered on our computer and a booking reference number is produced. At that moment, the contract between us begins. We will send you a confirmation after booking – please check it carefully to ensure all the details are correct. 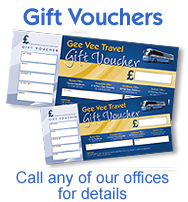 GEE VEE TRAVEL is a household name in South Yorkshire, a name that is associated with reliability and security. Our ownership provides you with the peace of mind to know that your money is safe and secure. As if this security were not enough, GEE VEE TRAVEL Tours are members of the MGA Cover services on behalf of Towergate Chapman Stevens through CBL insurance and adhere strictly to the requirements of the EU on Package Tours. If your tour includes insurance, details of which will be provided at time of booking or on request and insurance must be paid for at time of booking along with a deposit of £30 per person. The balance of the fare must be paid via the office at which you made your booking at least 6 weeks before the holiday departure date. If you book within 6 weeks of the departure date you must pay the full holiday cost at the time of booking. If the balance is not paid in time we reserve the right to cancel your holiday, retain your deposit, and apply cancellation charges, all tour fares are payable in sterling currency. If you want to make any changes to your booking such as changing the date or room type or joining point, we will do our best to help but we cannot guarantee to make the changes that you want. If we do manage to make the changes we will normally charge £10 per booking to cover our administration costs - plus any extra charges if you are buying a more expensive holiday. Some changes however are so significant that we will treat them as cancellations. Significant changes include; transfer to a different holiday or departure date within the balance due date. If it is impossible to go on holiday then, in some circumstances, you may transfer your booking to someone else (a transferee) if you give us reasonable notice. The transferee must be someone who satisfies all the conditions for the holiday. We will make an administration charge of £10 per person for every transfer we make. We will also charge you for any extra costs caused by the transfer. Both you and the transferee remain responsible for paying for the holiday. If you do transfer your booking to someone else, that person must take out separate insurance if insurance is required. You, or any members of your party, may cancel your holiday at any time provided that the cancellation is made by the person who booked and is communicated to us in writing or person via the office at which you made your booking. As this incurs administration costs we will retain your deposit and, in addition, may apply cancellation charges. If you have a complaint during your holiday, please inform our driver/courier, or representative who will do his/her utmost to resolve the problem immediately. If the matter cannot be put right on the spot you must notify us in writing after the tour ends. Please address your letter to: GEE VEE TRAVEL, 36-38 ELDON STREET BARNSLEY S702JB, and give the tour title and departure date. Failure to establish your complaint immediately in accordance with the above procedure may effect the outcome of it. This brochure is issued subject to applicable Acts of Parliament and Government Regulations and the company reserves the right to modify itineraries to conform with requests from the competent sovereign state through which the tours run. When travelling on an GEE VEE TRAVEL coach you are carried under the GEE VEE TRAVEL. Conditions of Carriage. When travelling on a ferry or transport provided by any other Courier, the Conditions of Carriage of that Courier apply and are subject to any applicable National Conditions or International Conventions which may limit or exclude liability. The Public Service Vehicle (Conduct of Drivers, Conductors and Passengers) Regulations as amended 1990, apply to all coaches throughout any holiday in the UK.